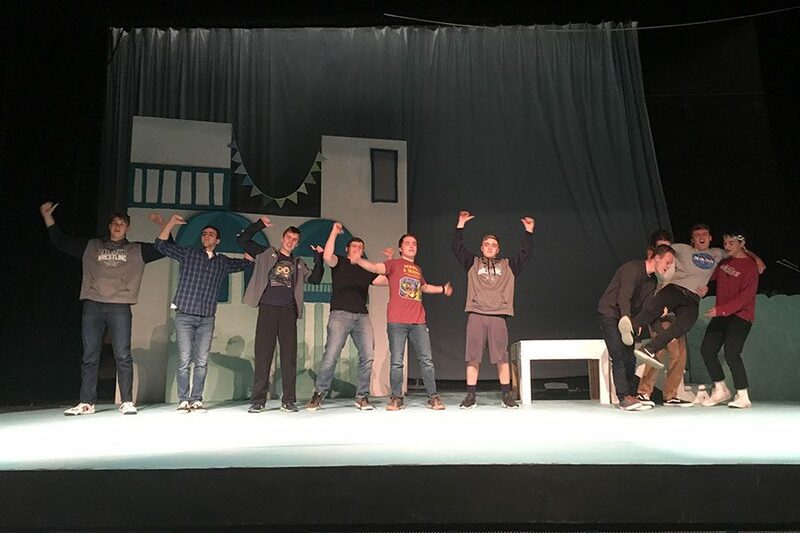 Members of the HBHS Wrestling Team (from left to right; Owen MacMillan ‘19, Tyler St. Pierre ‘19, Dan DeLong ‘19, Sam Koch ‘19, Robbie Dwyer ‘19 and Jack Duquette ‘21) join actors Jackson Lewis, playing an ensemble member, Mitch Cochran ‘20, playing Eddie, Josh Ide ‘20, playing Sky, and Evan LaFrance ‘20, playing Pepper, on stage for the song “Lay All Your Love On Me” during a rehearsal. At times during the musical, the wrestlers had just returned from the beach, and have been dancing with flippers on. “They've been very adapting to the flippers and very nice to us when we asked them to do crazy things,” said Golden. When the materials for a musical are ordered, all the sheet music and lines are written up and printed out for everyone to learn. But, even with all of these papers, there’s a piece of the performance still missing: choreography. For Mamma Mia, the choreography has been put together by three students, Johanna Golden ‘19, Sophia Whipp ‘20, and Delaney Weimer ‘21. Depending on the availability of other performances in a musical, student choreographers may or may not have some inspiration to work off of when they put together the dances for each scene. The rights to the choreography for Mamma Mia aren’t released, so Golden, Whipp, and Weimer needed to create completely original choreography for HBHS’s Mamma Mia rendition. After coordinating with Matthew Barbosa, musical director for Mamma Mia, and Claire Pare, director of Mamma Mia, it was up to the choreographers to get their “creative juices flowing” and “make up their own stuff,” according to Golden. The choreographers have enjoyed their time working on Mamma Mia. “The songs are really fun, so I really like choreographing to those,” said Whipp. Having student choreographers has been beneficial for both the choreographers themselves, as well as for the actors. “[An] amazing aspect of having the three girls as our friends as well as our choreographers is that we can always ask them questions. They’re always available to us outside of school or during CavBlock for us to be like, ‘Help, please! 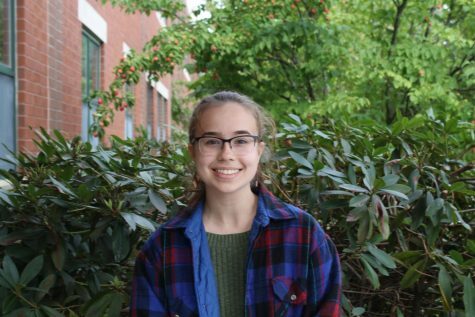 I don’t understand it,’” said Nicole Plummer ‘19, who will be playing Donna in the musical. Student choreography gives students who are interested in dance the opportunity to put together dances in a way they may not have been able to do at their own dance studio or classes. They also get the extra challenge of teaching actors, many who are not used to dancing and singing simultaneously, or even dancing at all. “It’s kind of hard to match the right level to make [the dances] interesting without making it too difficult,” said Whipp. Mamma Mia will be taking the stage at the HBHS auditorium on March 22, 23, 29 and 30, displaying the combined work of the choreographers, as well as many other talented HB students.